The handmade photography books in this show focus on new approaches to traditional methods of photography and bookmaking. The photographic work within the books highlight themes of time, weather, nature, space, and the history of photography. The books are available in small, limited editions, and are skillfully crafted by each artist by hand. Each book will be complimented by an installation of the artist’s photographic work on the wall. Dust Collective is a handmade photography book publisher and distributor, managed by Emily Sheffer. It was founded in 2017, and is based in Cambridge, MA. Join us at Aviary Gallery, (48 South St. Jamaica Plain, MA) on January 25th! At our sale, each poster is printed on newsprint paper, and created here at Aviary's lab. They will be available for $8 each, and the funds raised will benefit Aviary’s ability to continue hosting new exhibitions, providing digital lab services, and creating new and inspiring events for our community in 2019! Can’t make it to our Poster Sale reception on Friday night? Fear not! Posters will be available for purchase all weekend long- we just can’t promise any free cookies. At our sale, each poster is printed on newsprint paper, and created here at Aviary's lab. They will be available for $8 each, and the funds raised will benefit Aviary’s ability to continue hosting new exhibitions, providing digital lab services, and creating new and inspiring events for our community in 2019! WENDY EISENBERG is an improvising guitarist, banjo-player, vocalist and poet. Using the languages of free jazz, new music, extreme metal and art song, her music sets to pose and expose the questions surrounding the human body in the world and the representational and technical demands placed on it in artistic practice. She has written and performed in numerous projects, including the critically acclaimed experimental band, Birthing Hips, described by NPR as “brainy, noisy punk based in sonic adventure, technical mastery, and rejection of the status quo." Her work as an improviser has led to collaborations with Ted Reichman, Joe Morris, Damon Smith, John Zorn, Travis LaPlante and Zach Rowden, among many others. Eisenberg has premiered work by John Zorn, Maria Schneider, and Bill Holman, as well as the work of her many peers. In addition to her work as a collaborative artist, she has two solo careers: improviser/composer, and songwriter. Wendy’s debut record as an improviser will come out on the esteemed label VDSQ in 2018. Her “songs” album, Time Machine, released on HEC Tapes in April 2017, will be re-released on Feeding Tube records in the spring, and she is slated to release a new song cycle summer 2018. Wendy has provided soundtrack work for the scientific projects of MIT Media Lab fellow and scientist-artist Ani Liu. Her poetry has been set into a large scale work by Matt Curlee, premiered at the Eastman School of Music in 2014. Her writings on music can be found in John Zorn’s Arcana VIII: Musicians on Music, and on the websites Jazz Right Now and Free Jazz Blog. Eisenberg's music can be found at wendyeisenberg.bandcamp.com and birthinghips.bandcamp.com. CHRIS STRUNK is a Boston based percussionist and drummer. His solo work focuses on cymbal overtones, friction, and the vibration and rattle of non traditional objects used as percussion instruments. He has been an active show promoter and musician in the Boston area for the past sixteen years. He has been active in many groups such as Los Condenados, Avoidance, Taps, Phantom Rides, Sheer Anxiety, Conversions, Baja Blatz, Sleeper Cell, and many more. His first full length cd No Chart Could Map My Constellations is soon forthcoming on the newly minted, Philadelphia based label Killing Time Between the Ice Ages. Michael Rosenstein explores the interaction of acoustic and electronic sounds in collectively improvised settings. In his music, he uses amplified surfaces, oscillators and home-made electronics, distressed field recordings, harmonics and overtones, exploiting and feeding off of the resultant unstable sonic events. José Rivera (aka Proxemia) is an architecturally trained multimedia artist who creates electroacoustic and experimental sound works. He explores the intersections of aural and spatial experience through multi-channel installation and performance, aural cartography, architectural design, and environmental sound recording. He studied sound and art in MIT’s program of Art, Culture, and Technology. Pile is an American indie rock band from Boston, Massachusetts. Starting as the solo act of Rick Maguire in the late 2000s, Pile has been a collective since the release of "Magic Isn't Real" in 2010. However, from time to time Rick still performs Pile's songs solo. Kevin Micka plays music under the name Animal Hospital and has also played in the band Neptune. The Animal Hospital Ensemble is a project that evolved out of Kevin's solo work to include up 40 musicians in a circle surrounding an audience. His first sound installation is currently on view at the Aviary Gallery in this current group show. Mike Bullock is a composer, improviser, visual artist, and writer based in Holyoke, MA. Bullock has been performing since the mid 90s at venues across the US and in Europe, including Fylkingen in Stockholm, Sweden; Instants Chavirés in Paris; Café OTO in London; Experimental Intermedia and ISSUE Project Room in New York City; The Philadelphia Museum of Art; and EMPAC in Troy, NY. In June 2015, Bullock received a Performance Grant from the Pew Center for Arts and Heritage. Bullock is the Philadelphia Ambassador for The Kingdoms of Elgaland-Vargaland [KREV] and also serves as the KREV Minister of Fine Noise and Light. Vic Rawlings plays prepared cello and open circuit electronics in the form of an instrument self-made from exposed circuit boards and speaker cones...the sense of danger, the awareness that the music is poised permanently on the edge of disintegration and collapse. Despite its refusal to make the slightest concession to the listener, the music draws you in and doesn’t let you go. Visiting artist/teaching residencies have included Oberlin Conservatory, MIT, Harvard, UC Berkeley, UC Davis, Princeton, Dartmouth, and Wesleyan. Vic is an improvisor and has worked directly with Alvin Lucier, Michael Pisaro and Christian Wolff and has also performed works by John Cage, Karlheinz Stockhausen, and Cornelius Cardew. Ordinary Affects will perform two works by Morgan Evans-Weiler - a new version of his project 'Endless Overtones in Relational Space' for cello and sine tones and a trio for violin, vibraphone and cello 'General Motions in Relation'. J. P. A. Falzone is a composer and musician whose work is influenced by the conceptual turn taken in systems music. In 2014, he founded The Providence Research Ensemble and is also a member of Ordinary Affects, a Boston based new music collective. His work has also been performed by the S. E. M. Ensemble, the Ostravská Banda, and the Ostrava New Orchestra. This past Fall, Falzone began his graduate studies in music composition at Wesleyan University in Middletown, Connecticut. Morgan Evans-Weiler is a Boston based artist, composer, performer, curator, and educator whose work ranges from composition and sound installation to drawing and design. He is the founder of the New England based ensemble Ordinary Affects and he runs the lecture/concert series Standing Waves in Cambridge, MA. Evans-Weiler has toured both nationally and internationally, and his visual work has been displayed in galleries throughout the United States. He has been commissioned by the SD Soundings Festival, and his music has been released on the Suppedaneum, Another Timbre, Rhizome(S) and Weighter Recordings labels with forthcoming releases on ErstAEU. Forbes Graham is a trumpet player, electronic musician, and composer living and working in Boston, Massachusetts. He has worked with a diverse array of musicians and currently is a member of Para Quintet, Rock Flint Contemporary Ensemble, Wild May, Jazz Composers Alliance Orchestra, Grizzler, Construction Party, Equal Time and Citizens Orchestra. He is the founder of the Rock Flint Artists Retreat, and has appeared at numerous festivals including High Zero, Full Force, and Vision. In her normal, everyday, not at all irregular life, Angela is interested in fairly extreme, obscure, avant-garde music and frequently goes on stage just to make a lot of gargling and retching noises. She also writes record reviews and liner notes and even gets paid for that sometimes. You can read her writing at Perfect Sound Forever. A list of her current bands can be found on this site, as well as some musical recordings. When not making freaky sounds or creeping people out with esoteric musical history trivia, Angela sometimes hosts shows. For example, you can find out more about the show that happens in her house, Shaves, right on this site. Also, there’s a podcast called The Navel Gaze and a monthly variety show called The Weird and The Beard. Unknown Results is comprised of work with an element of perceivable order or structure within that may otherwise present itself as random or abstract architecture: an artist's intent to produce a result beyond their control. CURATOR STATEMENT: Self-portraiture is an age old practice merging artistic subject matter and the creator. In lieu of a sense of tradition or conventional presentation, SELF COMPOSED highlights works that seek to abstract, deconstruct, re-contextualize, and push at the boundaries that define a self portrait. Abandon your embroidery expectations and embrace freestyle stitching and experimentation during this hands-on Contemporary Embroidery workshop with fiber artist Sarah K. Benning. 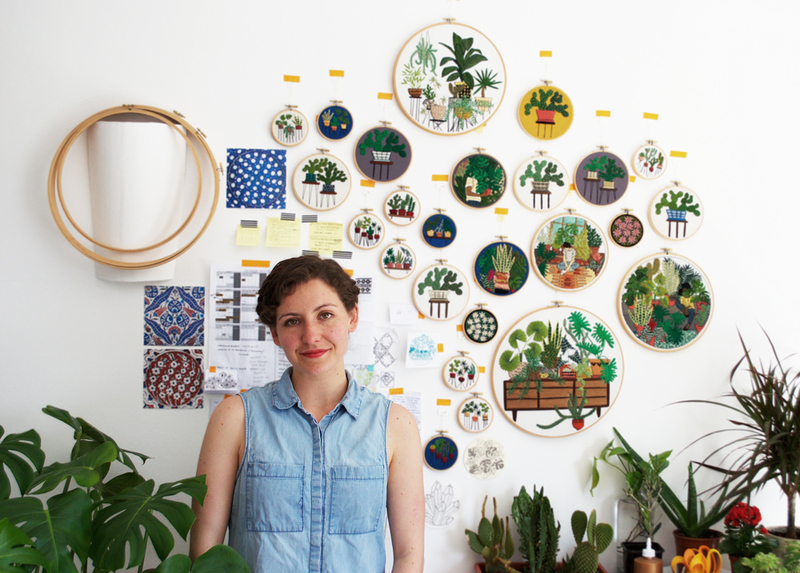 In this 4-hour session Sarah will help you prep your hoop and fabric, transfer a design from paper to cloth, and introduce you to some of her favourite stitches, while encouraging you experiment with mark-making and non-traditional embroidery techniques. A selection of workshop-exclusive botanical designs will be provided for you to get started, but there are no rules here, just you + your creativity! Sarah’s contemporary approach to embroidery pulls this craft out of the past and into the present with modern designs and a relaxed attitude. Her emphasis is on drawing, composition, and color choice over rigid structures and traditional stitches. This workshop celebrates intuitive decision making and a departure from the conventions of hand-embroidery, grants you permission to experiment with thread, play with color, embrace imperfections and leave full of inspiration and a new piece of wall art. *Participants are welcome to bring their own piece of special fabric if they would prefer, must be at least 7 x 7 inches and shouldn’t be too thick, dark, or stretchy. **Designs may differ from those in the images. ***A large selection of DMC floss will be provided for participants to share. BIO: Sarah K. Benning is an American fiber artist with a nomadic studio practice. Originally from Baltimore, she attended the School of the Art Institute of Chicago and received her BFA in Fiber and Material Studies. Shortly after graduating in 2013, Sarah discovered her love for embroidery and has never looked back. Sarah currently lives and works from home in the White Mountains of New Hampshire. This lecture will be a brief critique of the national history survey as the predominant form for organizing historical inquiry, specifically for high school and college students. Aviary has been open for 7 years!!! Come celebrate with us on Saturday, March 3rd! There will be drinks, snacks, and music (performers TBA). This will also function as the opening reception for the fibers show which will be on view through March. Along with celebrating our seven years in business, we're hoping to raise money to expand our programming and keep the space alive! We will be accepting donations during the event. If you can't make the event but would like to give Aviary a gift and be entered in a raffle, you may paypal info@aviarygallery.com. Thank you for all the years of support! We can't wait to see you on Saturday, March 3rd! On 12/16, we will be hosting our second trunk show of the holiday season. Our buy-off-the-wall holiday show will still be up as well for your viewing pleasure. We will also have wine, mulled cider, and snacks. Come buy gifts/come say hello! Swiftly Tilting: Boston Pops (Culture) Edition! Have you ever wondered what it's like to listen to music in July? The magic is coagulating very nicely indeed: Kofi Thomas | Andrew Abrahamson | Dead Letter & Kathleen | Andrea Pensado | John Staley | a visit from the Pope of JP (Christopher Carmelovich) + more.